Money GO Rounds is an online sharing marketplace empowering people to share services within the community. Users can share their resources, stuff, space, time, talent and skills. 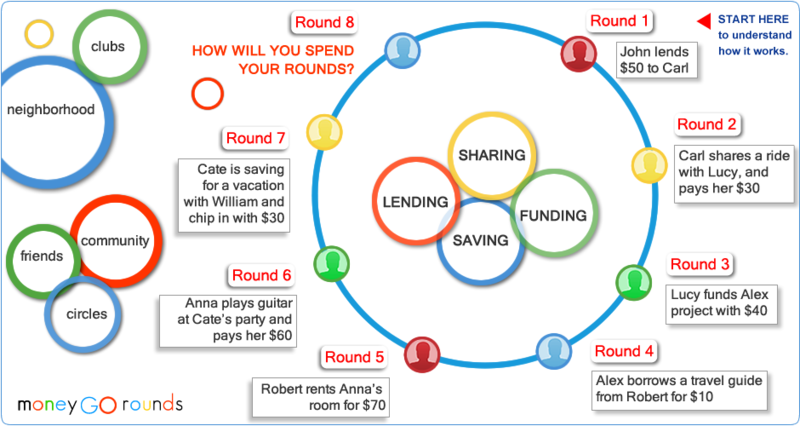 Money GO Rounds enables individuals to lend or borrow virtually anything, directly from each other. Items lent have included bycicles, parking spots, storage spaces, DVD's, books and tools. The site enables members to list their items to lend and see what others have on offer. Items can be lent for free, or lenders are able to charge for an item, and choose if they want to keep the fee or make a donation to a charity. Goods and services are advertised on the web site through an 'Offerings List'. Participants look through this list, or do a search, and if they find anything they want they contact the seller who then provides the goods or service. There is also a Wants List where participants can advertise for goods and services they require.